Photo Caption : Morse after Operation #1 : And not appreciating the bucket! I have often seen signs and heard announcements by pointer & setter field trial secretaries (at summer grouse trials) about the moorland danger with Adders. While I am aware that the Adders’ venom is poisonous, I have never taken these signs or the field trial secretary announcements with any seriousness. And why should I as I have never seen an Adder in all my years of running pointing dogs on moorland during the summer-autumn months. But August 1st 2012 was my wake-up call and hereby outline for the benefit of non-believers as caution and veterinary assistance is required. 2012 was developing into quite a year for our household. The brief late March Scottish Spring Grouse field trial circuit had resulted in a 1st for Morse (Bownard Boffin : Bownard Ali x Lusca Gin) as awarded at the Northern Counties (Amulree) trial and a 2nd for Marty (Ft Ch Lusca Celtic Boy : Bownard Ali x Lusca Emma of Ardoon) as awarded at the Pointer Club of Scotland (Cawdor) trial. At 4 years of age this win brought Morse (2008 pup) into the pointer & setter “Premiership” having only picked up 3rd and 4th awards in previous Open Stakes. As for Marty (2005 pup), this was a return to form after (yet another) serious illness that effectively took him out for the majority of 2011. The summer circuit (see table below) had also started well with Morse gaining a 1st award at the Duckeries (Burncastle) trial in mid-July; though this win did not quite grant him field trial champion status (since both his 1st awards had been awarded by the same A-Panel judge). 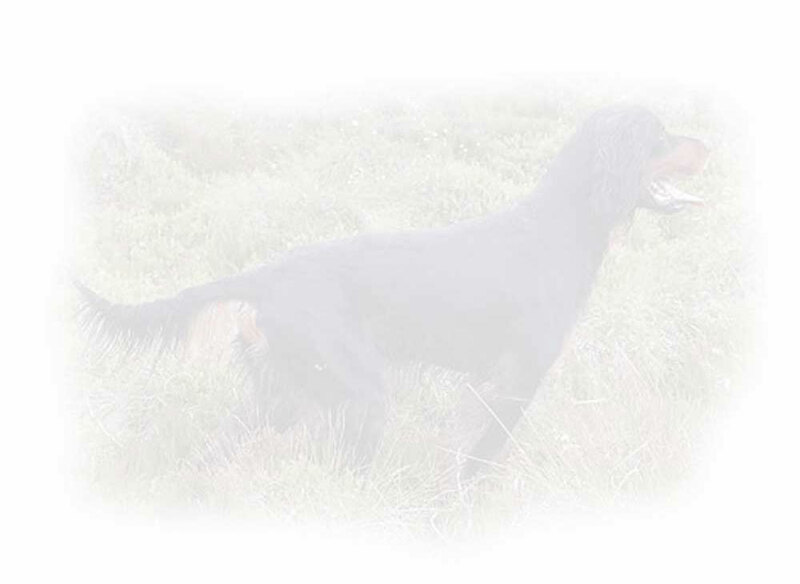 With the end of July approaching the field trial circuit (having weaved its way across the moors of northern England over the past couple of weeks) was now returning to Scotland for the five remaining summer circuit trials and ahead of the pointer & setter Champion Stake. I had two dogs qualified for the UK Champion Stake and was now beginning to consider if I should head over to the Emerald Isle for the Irish Pointer & Setter Championship Stake at the end of August. As such a level of excitement was creeping in as I made my final preparations. I left home early to head north to join the field trial circuit at Cawdor in Inverness-shire for the Northern Counties trial. The weather was overcast and un-seasonally cold, but that suited me and my team of red “devils”. Reaching the motorway I clicked the truck into cruise control to sit back, drink a can of Red Bull and listen to Alter Bridge : Live at Wembley; a fathers’ day gift from my son. Alter Bridge are one of my favourite rock bands and my appreciation of their music had overflowed as my son & I had named the two (2011) Erinvale pups after band members Brian Marshall & Myles Kennedy. This year, for the first time in ten years, there was no eyas falcon to man down and care for, removing general on-the-road anxiety and management overheads, thereby allowing me to solely focus on the field trials. Travelling north made me reflect on the challenges as faced during the summer of 2011, when I was driving around in a courtesy car (an X-Trail) as the automatic gearbox in my new truck had seized and had been shipped to Japan for what turned out to be a lengthy four and a half month investigation-replacement. The X-Trail, while a great vehicle, presented challenges from a dog accommodation perspective and as such had restricted my summer circuit trialing to day trips only. As I drove past Aviemore I recalled that the previous year I had broken a long standing routine in not stopping south of Carrbridge for a dog comfort stop. Instead I had continued travelling to “pit stop” (with permission) on the edge of the Ballindalloch estate, given that particular day return trip was to the Dorback estate. This year I reconnected with that routine and pulled into a forest track just south of Carrbridge. I had found this spot years earlier; it was ideal as it allowed the dogs to have a stretch in the forest while I attended to blocking out an eyas falcon and allowing her to air her head and cast, having been confined to the leather hood for a number of hours. This year, with no eyas falcon, I casually strolled down the forest track and breathed in the fresh mountain-pine scented air. It felt good and even better that the programme delivery pressures of work were now miles south and not to be thought of for the next couple of weeks. My mind then drifted to the trial and to the Cawdor estate as managed by Roddy Forbes and his team. The estate moorland extends to 30,000 acres and was a field trialers’ paradise; the overall topology being ideal for hard running dogs. Additionally the red grouse numbers, while good, were not heavily populated requiring the dogs to stretch their beat in search of this wonderful and sporting upland game-bird. I returned to the present as I heard a dog returning. It was Morse. I quickly glanced at him as he jumped into the rear of the truck. Was his head swollen? Just as I was about to take a closer look the other three setters returned to be eventually loaded up in their respective kennels. With that I closed the tail gate and walked round to sit in the passenger seat to have a cup of tea and a kit-kat chocolate bar (or two). Delicious . I then headed north to Carrbridge, driving over the Dava Moor, passing Lochindorb en route to Drynachen and the Cawdor field trial meeting place. Arriving at the meet I walked round to open up the rear of the truck to put on my walking boots. It is part of my routine and undertaken before I start mingling with fellow competitors, FT Secretary, judges and estate members of staff. However that routine was disrupted upon opening up the rear of the truck. Confronting me was a dog, whose head now resembled the actor John Hurts’ portrayal of Joseph Merrick in the film Elephant Man. Morse’ head was huge on the left hand side and probably twice its’ normal size. What had happened? I opened his kennel to take a closer look, though Morse was not in any rush to come forward. I reached in and accidentally touched his jaw and he yelped in pain. Just what had happened? I retreated, looked around the competitors who had arrived and noted Richard MacNicol. He knew pointers and setters inside out and so was the right person to seek advice from in such an emergency. As I approached he was commencing a conversation with Peter O’Driscoll, but I was concerned, needed advice and so politely interrupted. I explained the early morning “pit stop” routine, time-line and the situation I was facing with Morse. They broke off from conversation to approach the rear of the truck, looked at one another and said “Adder bite, keep him in truck and get to a vets quickly”. Word spread and it was not long before I was being given some sage advice by fellow competitors. Most notable was a graphic description by Colin Organ with regard the effects of the Adder venom would have if it had a chance to complete its “race” round the dogs’ system. 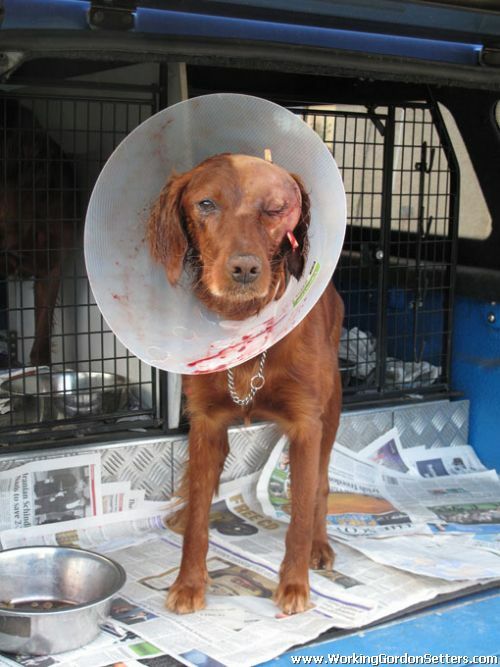 And his mitigating advice was to keep him in the truck, keep him calm and get veterinary assistance quickly. This all made me nervy and appreciate how touch and go the overall situation was. The ever-helpful Penny Darragh provided me with some herbal tablets to help ease the dogs’ pain in the short term, while also providing me with a small tub of charcoal capsules that (once the dog was eating) would assist in absorbing and removing body toxins. And other offers of help, advice and support were forthcoming. All very touching. Cawdor is remotely located estate and is distant from even a B-class road. However Wilson Young knew the country road network well and very kindly offered to lead me via some back roads (to reduce journey time) to a Grantown On Spey veterinary practice he had used some years previously. There Morse was examined, though the vets were puzzled by the sensitivity around the dogs’ jaw. As such the dog was provided with three injections to combat swelling, infection and provide some pain relief, and I was instructed to return the following afternoon so that they could undertake a veterinary procedure. I do not know whether it was the effects of the injections or the increasing head swelling, but Morse started to lie his back; most likely to try and ease the ever-increasing pressure on his skull. Additionally (given jaw sensitivity) the dog was refusing to eat. My concern level was increasing and even my own appetite and focus were affected. The next day Morse underwent an emergency procedure. As the surgery was to take a couple of hours, I walked round Grantown On Spey to pass the time. While I did so mostly in a daze, I was brought back to the present when meeting fellow field trailers returning from the days’ trialing; John Hadley and Steve Roberts kindly enquiring as to the dogs’ state of health. It was going to be a long wait, though I suddenly became aware that the car keys were not in my pocket. I walked up and down the High Street, focussing on pavement and places where I seemed to recall idling and perhaps accidentally removing the keys from my pocket. But no avail. I returned to the vets to check and enquire there, but no joy. I looked round the car, but no joy again. I then looked into the rear of the truck to ensure the rest of the dogs were comfortable and at ease and it was then I could see the car keys. They must have fallen out of my pocket when easing Morse out of his kennel. I re-entered the vets to ask for some wire or anything flexible to allow me to reach the keys. At the same time the vets placed a call with a local garage for road-side assistance. While trying various materials David Hall approached to enquire if he could be of assistance. We tried to use various blades from his Swiss army knife to open a rear window, but without success. He then mentioned he had a salmon fishing rod as yet to be christened. I saw the worry on his face as he saw me take the thinnest rod section to twist and bend in order to try and reach and “catch” the car keys, though also saw the relief on his face when I handed it back in one piece. God bless him for that offer. David hung around and assisted while I tried various other flexible materials as offered by the veterinary practice. However all was brought to a close when a mechanic from the local garage turned up and retrieved the keys in minutes. Morse was then collected from the vets and looked rubbish; even more so since he now had to wear a “bucket” to prevent scratching of the infected, stitched and tubed, head area. The operation revealed (after shaving of the left side of his head) that he had in fact been bitten twice, though luckily on the orbital ridge above his eye. While the tenderness around his jaw was probably due to the fact he winced and had run into a branch of a fallen tree upon return to the truck. This “conclusion” was evidenced via a hole as detected within his inner mouth; as such another procedure would be required to investigate further and remove any branch fragments. The next morning the vets were to undertake a follow-up exploratory procedure to see if any part of the branch still remained. As such I travelled to Dorback (Pointer Club of Scotland) for the open stake trial, but found difficulty focussing on events and eventually excused myself from the field to return to the vets. The outcome of the surgery was that nothing had been found, though now the dog had an inner-mouth full of stitches. With Morse now requiring rest, I withdrew from the Tillypronie trials (as run by the North of Scotland Gundog Association) to head south and return home. Though I was heading home I had club commitments a few days later as I was scheduled to backfill for Jon Kean (SFTA field trial secretary) on day-2 of the Scottish Field Trials Association trials at Tollishill & The Hopes in the borders of Scotland. Additionally, and on the subsequent two days, I was acting field trial secretary at the Pointer & Setter Champion Stake, given Jon (along with Steve Lound) was judging at this premier event. I thought about various alternatives given my away from home status, though a visit to my own vet did reduce my level of concern. Furthermore I knew Carole Brown from Cornwall would be competing at the SFTA trials and the Champion Stake, so at the very least I could have (if I asked nicely ) interim veterinary support in the field should anything un-toward develop. That said the head swelling continued to reduce and lowered my level of concern. In all it did appear that the dog was on the mend, though I continually recalled Colin Organs’ advice and elected to apply to the letter with regard no running for a few months. Additionally (and now that the dog was eating) I was applying the charcoal capsules (as previously provided by Penny) to the dogs’ food in an effort to speed up the removal of toxins from the dogs’ “system”. And I am glad I applied Colins’ advice as Morse (while he looked normal) started to develop eye sight issues in early September. This brought about another intrusive surgery procedure a couple of weeks later, though successfully resulted in the retrieval of a small piece of branch. However the real learning is an increased appreciation of my fellow competitors, given all the support and advice as received during those traumatic days in early August. Field trialing is a minority field sport undertaken by enthusiasts who are competitive by nature, extremely passionate about their pointer-setter breed of choice and yet take delight in seeing natural ability, dog handling excellence and precise, technical dog work. And these same people do and can rally round in times of difficulty whether to support a fellow field trialer (as clearly evidenced within) or add voice to a field sport debate. So while it is easy to look and marvel at a trophy upon seeing the names of famous dogs of old engraved, let us not forget those who also attended the same field trials to provide the competitive edge and the endearing camaraderie. Given the level of focus, dedication, energy, cost and time required for a pointer-setter to attain field trial entry qualification, all competitors are winners of this fantastic sport in my eyes. So let’s remain cohesive, continue to enjoy our sport and each others’ company, be positive with regard the present and future outlook and leave a legacy worth remembering for future generations.